Blog postings by CEPR staff and updates on the latest briefings and activities at the Center for Economic and Policy Research. The economy lost more than eight million jobs during the Great Recession. Last year, it recovered just over one million of those lost jobs. But, a new report from the National Employment Law Project demonstrates that the new jobs were heavily concentrated in low-wage industries such as retail, restaurants, and temp agencies. 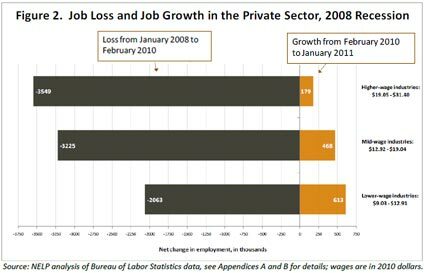 As the NELP figure above shows, about 3.5 million of the jobs lost in the downturn were in high-wage industries, but fewer than 200,000 of the jobs created in the last year were in those same industries. Over half of the jobs created since the economy bottomed out were in the lowest-paying industries. As the report's author, Annette Bernhardt, says: "[T]he job opportunities currently available to workers have deteriorated compared to what was available before the recession." The NELP data flatly contradict the idea that the economy is currently facing a structural "mismatch" where workers don't have the skills that employers are demanding. The recession-related job losses were concentrated in high-wage industries and the new jobs have been in low-wage industries, leaving millions of workers from middle- and high-wage industries high and dry. For over a year now, a debate has been raging over whether public-sector workers are paid too much. In the last few days, spurred by the protests in Wisconsin, Jim Manzi, Kevin Williamson and other conservative newcomers to the debate have been embarrassing themselves and making things uncomfortable for some of their fellow conservatives who have been engaged in the debate longer. If like Manzi, you are new to this, you'd be excused for thinking that the main issue is whether or not it makes sense to gauge the level of public-sector pay using what economists call "human capital" models. These models are among the oldest and most successful empirical models in all of economics. They argue that workers' wages and benefits generally reflect their level of education and their work experience, both of which are proxies for their underlying skills or productivity on the job. A vast empirical literature supports this view, showing a strong relationship between pay, education and experience, in virtually every country and every period that economists have ever examined. That said, even this strong empirical relationship leaves a lot of the variation in wages across workers unexplained. Even with identical levels of education and experience, women make less than men, blacks less than whites, residents of Wyoming less than residents of Connecticut. And even among, say, white women who live in Connecticut and have the exact same level of education and experience, pay can vary substantially. Typically, "human capital" models are lucky to explain 30 or 40 percent of the total variation in wages. For the third consecutive month, the Case-Shiller 20-City index fell by at least 1.0 percent, with home prices continuing their plummet from the index's peak in July. Nineteen of the 20 cities had a drop in prices in December. The exception was Washington, D.C. where prices rose by 0.3 percent. While in prior months the sharpest declines had been in the Midwest, the December data shows a more diverse pattern. Tampa — one of the epicenters of the housing bubble — experienced the sharpest price decline at 2.6 percent, followed by a 2.3 percent drop in Detroit and a 2.0 percent decline in Seattle. The situation in Seattle is interesting since the city, like Portland, had previously been shielded from the worst effects of the housing bust. It seems that this is no longer the case as prices in both cities are now falling rapidly. For more, check out our latest Housing Market Monitor. You have to give Wisconsin Gov. Scott Walker and his wealthy patrons credit. Here we have a situation where Wall Street fat cats wrecked the economy — people like Richard Fuld, Robert Rubin, and Angelo Mozilo — and they've somehow managed to blame schoolteachers and the highway patrol. Now we have a situation where the villains are sitting on their hundreds of millions of dollars, while tough guys like Gov. Walker are beating up school teachers to take away their $2,000-a-month pension. And, the best part of the story is the Walkers are being heralded as statesmen for their efforts. This situation speaks to the incredible corruption of U.S. politics. There have been numerous studies done by serious economists that all show the same thing, public-sector employees are not paid on average more than their private-sector counterparts. Why Is Gov. Christie Afraid to Tackle the REALLY Big Thing – Jobs? Yesterday, the American Enterprise Institute hosted an address by New Jersey Gov. Chris Christie titled ‘It’s Time to Do the Big Things.’ So, how is New Jersey doing on the big things that really matter to the living standards of the state’s middle class and working class families? As it turns out, not so well. Even as employment in the U.S. slowly increased during 2010, New Jersey continued to experience job losses. In the year after Christie took office, non-farm payroll employment in the Garden State fell by 30,700 jobs from 3.859 million in December 2009 to 3.828 million in December 2010. Average hourly earnings are down in nominal terms over the year to November 2010 (most recent available data) from $26.84 to $25.78 and weekly earnings over the same period declined by nearly $31, from $909.88 to $879.10. New Jersey’s unemployment rate remains above 9 percent, with much of last year’s modest improvement in the unemployment rate due to the shrinking labor force, with nearly 41,000 workers going missing during the year. Attacking teachers and public sector workers, failing to make required payments to the state’s pension fund, reducing payments to cash-strapped cities and municipalities, and cutting state programs may make great political theater, as a self-satisfied Christie seems to think. And it may mesmerize his fellow Republicans. But the evidence is clear – these policies have hurt, not helped, New Jersey’s economy. The latest Bureau of Labor Statistics' report on the Consumer Price Index found the index rose 0.4 percent in January while core prices rose only 0.2 percent, providing little evidence of inflation. Energy prices rose 2.1 percent in the month and were once again the main cause of the greater headline inflation. By contrast, food prices have not seen high inflation. Food prices rose 0.5 percent in January, but over the last 12 months food prices have risen only 1.8 percent compared with a rise of 1.6 percent overall. Among categories of core consumer prices, housing prices rose 0.1 percent in January as rent and owners’ equivalent rent remained stable at 0.2 and 0.1 percent respectively. Transportation prices rose 1.3 percent in the month—assuredly all due to higher fuel prices. The price of medical care rose 0.1 percent in January as hospital services fell 0.1 percent following last month’s 0.7 percent rise. Over the last six months, the price of medical care overall has remained at a relatively modest 3.0 percent rate of inflation. There continues to be little indication of core consumer price inflation within the economy. Where core prices do appear to be growing, much of the price growth appears to be capturing energy prices. For more, check out our latest Prices Byte. Is New Jersey Gov. Chris Christie Presidential Material? POLITICO's blog, The Arena, recently asked: In a Wednesday afternoon speech at the American Enterprise Institute in Washington D.C., New Jersey Gov. Chris Christie called for raising the retirement age on Social Security. His willingness to tackle politically delicate entitlement programs follows his approach in New Jersey of taking on teachers’ unions and other groups. Can Christie portray himself as a teller of difficult truths and become a credible White House candidate in 2012 or 2016? Or will his YouTube-friendly shtick soon wear thin and render him largely irrelevant in Democratic-leaning New Jersey? The fact that Gov. Christie is willing to do whatever Wall Street and the elite media tell him does not suggest that he has strong leadership qualities. If he had strong leadership qualities, he might take a moment to look at the Social Security trustees report himself, or at least talk to someone who had. He would discover that the program can pay 100 percent of all scheduled benefits through the year 2037 and nearly 80 percent of scheduled benefits after this date for the indefinite future. After 2037 retirees would always get a larger benefit than current retirees even if Congress never does anything. Is Obama's Budget a Deficit Enabler? Do people who write on the budget have any understanding of the topic? The answer seems to be "no," since we have an obsession with the size of the budget deficit when the economy has 9.0 percent unemployment. If budget reporters understood their topic, then they would be asking politicians like President Obama and the Republican congressional leaders why they are not doing more to create jobs. The reason that we have 9.0 percent unemployment is that private sector demand plummeted in the wake of the collapse of the housing bubble. In the short-term, the only way this demand can be replaced is by increased demand from the government. This is why reporters should be pressing politicians as to why they are not supporting larger deficits in order to get people back to work. Tens of millions of workers are suffering from unemployment or under-employment not because they lack the skills or desire to work, but because people like Alan Greenspan and Ben Bernanke failed disastrously in their roles as managers of the economy. This amount of needless suffering should be unacceptable in the United States. This is the fourth installment of a new weekly feature at the CEPR blog. Every Friday, we'll post a list of labor market related policy research reports from progressive research centers around the country. This week, reports from Center for American Progress, Center on Budget and Policy Priorities, Economic Policy Institute, Institute for Women's Policy Research, National Employment Law Project, and Political Economy Research Institute. The third option, that apparently many Washington policy wonks are smiling upon, is a hybrid system with private institutions buying mortgages with a government guarantee standing behind them. (Depending on the construction, the government may either guarantee the institution or the mortgage backed security -- more likely it will be the latter.) According to a new paper by Moody's, this sort of hybrid system will reduce the cost of a 30-year mortgage by 90 basis points (9/10ths of a percentage point) compared to a purely privatized system. The Moody's analysis also calculates that it will raise house prices by 8 percent compared to a privatized system. President Obama has given little indication of the strategy for his upcoming trip through Chile, Brazil, and El Salvador. Will "the great listener" promote cooperation and understanding, or carry on the Bush administration’s approach of fighting against regional alliances? President Bachelet emphasized the need to understand the nuances of Latin America’s leaders and their countries rather than lumping them into populist and pro-western camps … emphasizing that Morales was very different from Venezuela’s Hugo Chavez. This graph by World Bank economist Branko Milanovic made the rounds last week. To construct the figure, Milanovic first took the population of each of the four countries shown and ordered them from poorest to richest. Then, still within each country, he divided each of the ordered populations into 20 equal sized groups. 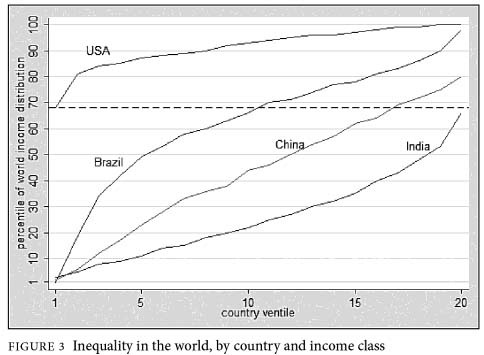 The bottom group –a "ventile," for one-twentieth– has the poorest five percent of people in each country. The next ventile has the next-"richest" five percent, and so on, up to the last ventile, which contains the richest five percent of the country's population. What is particularly interesting about this graph is that it allows us to compare the average earnings of the various ventiles across the four countries. So, for example, we can see that the average income in the poorest ventile in the United States appears to be higher than the average income of the richest ventile in India. This is an astonishing result and Milanovic, but especially many of the bloggers who covered the graph, make a lot of it. $44 trillion is a really big number. None of us, not even Bill Gates, will see anything close to that amount of money in our lifetime. It can sound very scary, which is exactly why the business-oriented group Third Way used it in reference to the projected shortfall in Social Security funding over the next 75 years. This was supposed to scare people into supporting cuts to Social Security to overcome this huge shortfall. A more honest approach would try to put this number in a context that makes it understandable to people. This can be done by providing a basis of comparison for this $44 trillion number. The graph below projects the revenue from a financial speculation tax over the next 75 years, using the same methodology as Third Way’s Social Security graph. This tax would apply to trades of stocks, options, futures, credit default swaps, and other financial assets. The tax would be set a low rate so that it would just reset trading costs back to the level of the 1980s or early 90s. Such a tax would have almost no impact on ordinary investors, even if it would be a big hit to Wall Street speculators. The United Kingdom has had this sort of tax for decades (although just on stock trades) and still has the largest financial market in Europe. 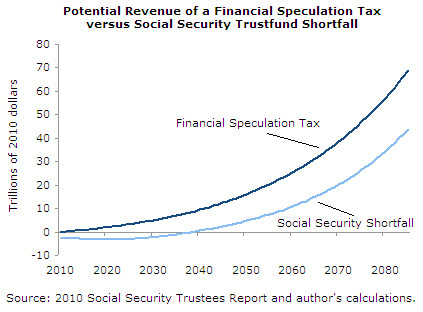 If the projected shortfall in Social Security is a big scary number, we can easily raise an even bigger scarier number just by taxing the sort of Wall Street high-rollers who brought on the economic crisis. Or, to put it slightly differently, we can compare the Third Way’s $44 trillion to projected future income over Social Security’s 75-year planning period. It is equal to 0.6 percent of future income over this period. Third Way could have found this number in a few seconds by looking at the Social Security Trustees Report. Most people can understand what 0.6 percent is, but it isn’t quite as scary as $44 trillion. This is the third installment of a new weekly feature at the CEPR blog. Every Friday, we'll post a list of labor-market-related policy research reports from progressive research centers around the country. This week, reports from Center for Economic and Policy Research, Economic Policy Institute, and Political Economy Research Institute. The unemployment rate fell by 0.4 percentage points for the second consecutive month, but the news is hardly worth cheering about. The establishment survey showed a gain of just 36,000 jobs in January, following a revised gain of 121,000 jobs in December, according to the latest Bureau of Labor Statistics employment report. The average rate of job creation over the last three months has been just 87,000, a rate that is not enough fast enough to keep pace with the growth of the labor force. Furthermore, there is no sector showing especially strong growth. With the exception of manufacturing, which added 49,000 jobs, growth in other industries remained weak or non-existant, and there is little evidence that employers are about to pick up the pace of hiring. The big gainers in January were white men, who saw their unemployment rate fall by 0.6 percentage points for the second consecutive month; although at 7.9 percent it is still somewhat higher than the 7.0 percent rate for white women. The unemployment rate for Hispanics also fell by 0.6 percentage points to 11.9 percent, but there was little change in the employment situation of blacks, whose overall unemployment rate of 15.7 percent remains near the peak for the downturn. For more info, check out our latest Jobs Byte. Kudos to the Huffington Post for a devastating, in depth piece about underwater homeowners: Learning To Walk: Fear, Shame And Your Underwater Mortgage. In it, HuffPo follows up with almost 50 underwater homeowners whom they first contacted a year ago about their predicaments. They detail their struggles (and failures) to get mortgage modifications and short sales approved, and how they came to different decisions about staying in or walking away from (a.k.a. strategically defaulting on) their homes, reflecting their varied life situations. Almost all would've been helped if they had the Right to Rent. Some would've been able to stay in their homes, while paying a lower monthly rent than their mortgage payments, and getting out from underwater. Others may have had more leverage with their banks if they had the option of Right to Rent, even if they didn't choose to exercise that option in the end. A Home Owners Loan Corporation as in the New Deal, and effective foreclosure relief, partly through a right-to-rent law, would move the housing crisis toward resolution. The Right to Rent Plan was originally conceived by CEPR's Dean Baker. Endorsements of the concept have popped up in the mainstream media, on blogs, and on Capitol Hill -- for details, including how much homeowners in many areas could save by renting, see CEPR's Right to Rent issue page. Can You Find the Structural Unemployment? The Washington Post told readers that the economy’s problem is not a lack of jobs, but rather that workers don’t have the right skills for the jobs that are available. This is known as structural unemployment, a situation where there is a mismatch between the available jobs and the skills of the workers who need jobs. There are some simple implications of the existence of a problem of widespread structural unemployment. We are asking about a widespread problem because we are trying to find an explanation for 15 million people being unemployed. They are always narrow niches of the labor market where employers may find it difficult to find workers with the right skills. However, you cannot re-employ 15 million people in these narrow niches. The following highlights CEPR's latest research, publications, events and much more. On January 9th, CEPR released a paper titled “Haiti’s Fatally Flawed Election” that described the results of an independent recount of all 11,181 vote tally sheets from Haiti’s November 28, 2010 presidential election. CEPR’s review found that based on the number of irregularities in the tally sheets, it is impossible to determine who should advance to second round elections, and that if there were a second round, it would be based on arbitrary assumptions and/or exclusions. The paper received a lot of attention in the press from, e.g, the BBC, The Independent (UK), CBC, and AP and was featured in this article in the Toronto Globe and Mail. It has also been cited by prominent figures such as Rep. Maxine Waters and Haiti’s former Ambassador to the U.S., Raymond Joseph (in a Wall Street Journal op-ed). On January 11, 2011, CEPR received a copy of a draft of the Organization of American States’ (OAS) “Expert” Mission of the election. CEPR then put out an issue brief that exposed flaws in the OAS Mission’s analysis. Both the initial paper and the issue brief had a great deal of impact in Haiti (Both the paper and the issue brief are available in English, Spanish and French). The U.S., France, UN, and EU have exerted pressure on Haitian President René Préval to accept the OAS recommendations regardless of the OAS Mission report’s flaws, and he has been using CEPR’s report to strengthen his arguments against accepting the OAS’ conclusions. This is the second install of a new weekly feature at the CEPR blog. Every Friday, we'll post a list of labor market related policy research reports from progressive research centers around the country. This week, reports from the Center for American Progress (CAP), the Center on Budget and Policy Priorities (CBPP), the Economic Policy Institute (EPI), the Institute for Women's Policy Research (IWPR), and the Political Economy Research Institute (PERI). Last August, the Congressional Budget Office projected that the budget deficit in 2011 would be $1.066 trillion. Two days ago, the CBO revised the projection upwards by 39 percent to $1.480 trillion. What drove the projected deficit to rise by $414 billion in the last few months? Has there been a burst of new spending out of Congress? Absolutely not. In fact, projected spending has fallen by $5.5 billion since August. Rather, projected revenues have fallen by $419 billion. Of the $419 billion decrease in projected revenues, $354 billion of this was directly attributable to the tax cuts enacted during the recent lame-duck session. The deal did include $37 billion in new spending-- $35 billion of which was extension of unemployment benefits—but the fact that total spending fell by $5.5 billion means that falls in projected non-UI spending more than made up for the new spending. Given that the projection for total spending has fallen, the budget numbers may look a little funny out of context. The "on-budget" numbers—excluding the Social Security surpluses and net cash flow of the Postal Service—show an increase in projected spending of $74.3 billion. This was entirely due to the payroll tax cut. Instead of cheating current beneficiaries by running down the trust fund, Congress moved $84 billion of Social Security spending on-budget. Outside of that accounting change, on-budget spending fell by $10 billion. In short, it is true that CBO's projected deficit for 2011 has grown since August, but clearly it has nothing to do with increased spending. A plunge in imports contributed 2.4 percentage points to the 3.2 percent growth rate in GDP for the fourth quarter of 2010, according to the latest Bureau of Economic Analysis' report on the Gross Domestic Product. With imports falling at a 13.6 percent annual rate in the fourth quarter, the replacement of foreign-produced goods by domestically produced goods was the largest factor propelling growth. Consumption of durable goods, led by a surge in new car purchases, added another 2.26 percentage points to growth for the quarter. The drop in imports was clearly associated with the slower pace of inventory accumulation. Inventories grew at just a $7.2 billion annual rate, compared to a $121.4 billion rate in the third quarter. Many of the goods that end up in inventories are imported so the two components generally fluctuate together. The slower pace of inventory accumulation subtracted 3.7 percentage points from GDP growth. Final sales of domestic product grew at a 7.3 percent rate in the quarter. For more info, check out our latest GDP Byte.